Looking for the perfect St. Patrick's day preschool activities to save you hours of time and make wonderful memories for your preschool or homeschool classroom? 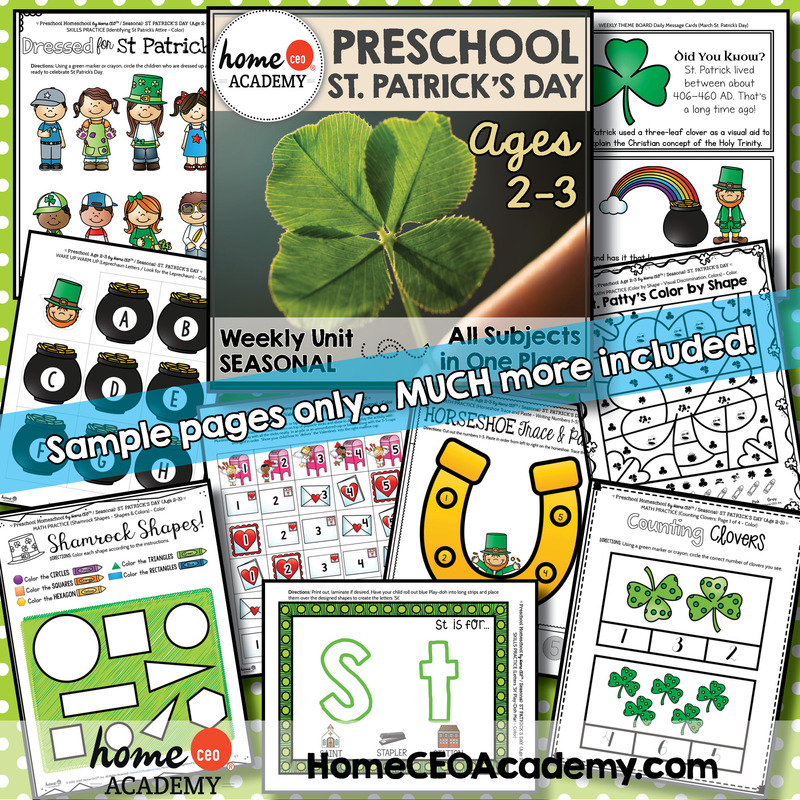 If so, this jam-packed St. Patrick's preschool pack is for you! With this printable St. Patrick's Day activity pack your students will enjoy hours of St. Patty's preschool fun! 200+ pages of language, math, crafts, social studies, reading, gross motor, fine motor activities and more! You will recieve two preschool St. Patrick's Day units: one for ages 2-3 and another for ages 3-4 with increasing challenge. Many of the activities can be interspersed with both age groups and with kindergartners as well as extra practice. The two units are available in our complete year programs. (If you're looking for a complete year program to start next school year, click here)! We provide both color and black and white versions of our activities. This preschool St. Patrick's Day curriculum pack includes over 500 pages of fun for your preschool classroom (200 pages of St. Patrick's Day fun and over 300 pages of our exclusive circle time and classroom decor bonues). The materials are highly engaging, super fun and organized to delight both teacher and student alike and lead to a successful week studying early learning skills through the theme of the St. Patrick's Day holiday. Our preschool St. Patrick's Day units cover all academic areas for a three days/week routine that easily stretches to five depending on the amount of material you cover each day: You will receive two St. Patrick's Day packets - one for ages 2-3 and another for ages 3-4. The activities may be easily be used as extra practice for age 5 kindergartners as well for extra practice. Plus instructions, overviews and more. Home CEO is a social enterprise, meaning it's profits are intended for a public benefit. We actively distribute 100% of profits from our store each month to outstanding nonprofit humanitarian organizations. We have donated to over 30 organizations who support education and the eradication of poverty, disease and human trafficking. Learn more about who we support on our "About" page. Copyright 2015-2017 Home CEO Inc. 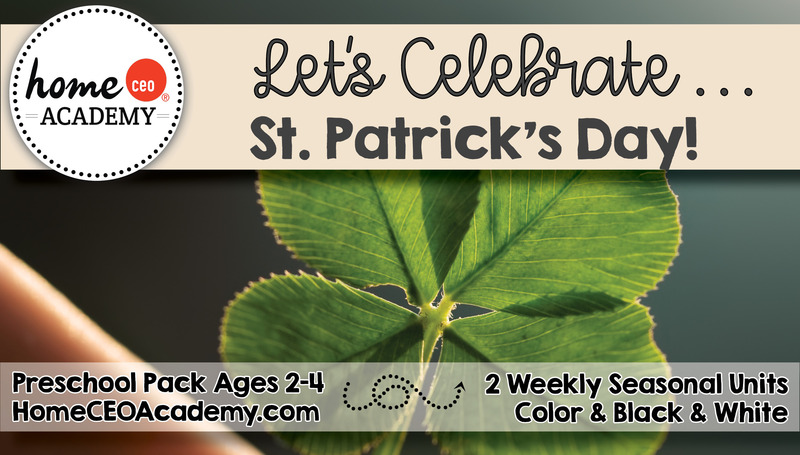 Instant Access to 2 Weekly Preschool St. Patrick's Day Lesson Plans and Printables. 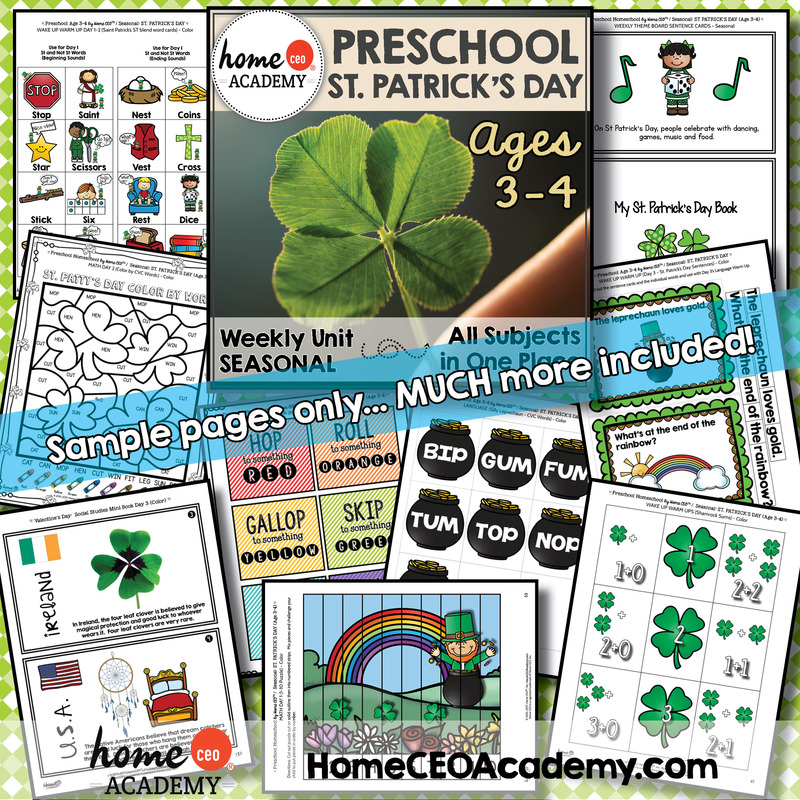 200+ Pages of St. Patrick's Day Preschool Fun Plus Our Classroom Decor Bonus Pack (a $15 Value), Absolutely Free. This is a Printable Program. Nothing is Mailed.